Kids Basketball Sports Fan Desk, Wooden Construction with Drawer, Glossy Finish and Easy to Clean, 35'' by Rack Furniture by Little Partners at Indsight. Hurry! Limited time offer. Offer valid only while supplies last. 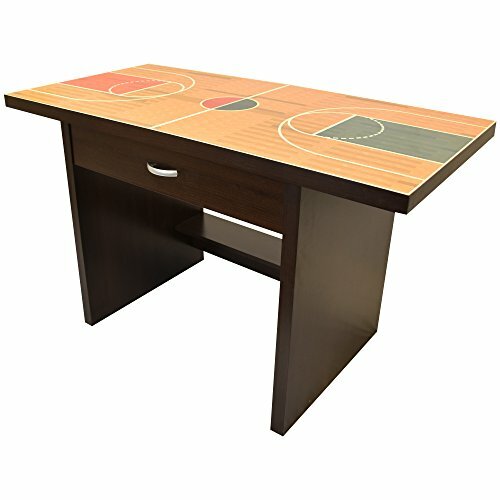 Basketball Court Graphics - The desk features a basketball court design on the table top. Help your child grow their love for sports all while promoting a creative and fun work environment for your toddler while they learn and do their arts and crafts projects. Stable and Strong Wood Construction - Our desks are constructed of wood for stability and strength. Because our desks are strong and versatile, our desks are also perfect for day care and dorm style settings. Have peace of mind knowing that our desks withstand all types of use. Spacious Drawers - The desk includes two integrated drawers with metal handles. The drawers are large enough to store arts, learning, and study materials such as crayons, pencils, markers, papers, and whatever else is necessary to help your toddler grow their creative side. Easy to Clean - The desk includes a melamine covering for a beautiful glossy finish and easy cleaning. Being creative can get messy sometimes, but know this desk can withstand whatever arts and crafts activities that your child loves. Wipe down the desk with a damp cloth for easy cleaning. Easy Assembly - The desk is easy to build and can be assembled in just minutes. All the necessary tools and materials for assembly are included with purchase. After complete construction, the dimensions of the desk are as follows: 54"L x 40"W x 35"H.
If you have any questions about this product by Little Partners, contact us by completing and submitting the form below. If you are looking for a specif part number, please include it with your message.